2011 Heisman Trophy winner at Baylor University who was drafted 2nd overall by the Washington Redskins in 2012 and went on to win the NFL Offensive Rookie of the Year award. After four years in Washington, he signed with the Cleveland Browns in 2016. 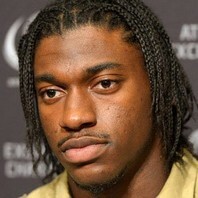 How much is Robert Griffin III worth? There is power in prayer, Trust God!!! Happy Resurrection Sunday! He is Risen!!! !